How Could the Federal Government Spend So Much and Get So Little? The government contractors in the Healthcare.gov project continue to make fortunes after delivering a technical disaster. Unfortunately, this is common among IT projects delivered by large government contractors. Each year the government spends billions for poorly designed or non-functional systems that never even get deployed. When I wrote my original blog post about Healthcare.gov, I thought the web site was created by incompetent people. Now I believe that in addition to being incompetent or inexperienced, decisions were made to maximize contractor profits. This is philosophically different from the way we think at FMS. We always want to deliver functional systems on-budget and on-time. We take pride in creating solutions that don’t require additional work to fix them. As a small firm, we’re held accountable for our deliverables. If we fail, we would never be invited back. For large government IT contractors, it’s a totally different world. Over the years, many large IT government contractors have abused taxpayers so often that they forgot the public would actually use Healthcare.gov and judge their performance. Even now, with their legions of lawyers and media spin, they are deflecting the story to blame government officials, other contractors, etc. without taking any responsibility. I agree there were problems with other parties, but that’s in addition to their own behavior. Government contractors are experts at adding change orders and generating more revenues for features that should be already included. For instance, we are now hearing about problems with data security for the Healthcare.gov site. Security should be implemented from the beginning. Anyone with any experience collecting personal information such as social security numbers and birthdays knows that. However, the government contractors who won these contracts based on “past performance” suddenly suggest others are to blame for not specifying it earlier. That’s like buying a car and discovering brakes were an add-on. No, it should be included without asking for it. Storing data requires doing it securely. Given the awful work delivered on October 1, there’s no chance that the same team can be trusted to deliver a functional system. They already showed the world what they considered shipping quality, yet they remain. Unfortunately, our existing procurement system keeps these large government contractors because they are simply Too Big to Fire. A small government contractor that performed so badly would not be allowed back into these agencies. The large ones can deflect the blame and legally challenge any attempt to hold them accountable. They never issue refunds, and in fact, profit from their mistakes with awards of new contracts and change orders. They are effectively not held accountable for their awful past performance, so the disasters repeat themselves whether it’s at HHS, FBI, Air Force, IRS, etc. The federal government is littered with expensive projects that were never used or functional, but highly profitable for the contractors. What happened with Healthcare.gov is exactly what our system encourages contractors to do. Had the contractors finished on time and properly, they would have made less money than delivering a flawed system. The government has tried to privatize its services by using outside contractors. Unfortunately, these government contractors are specialists at getting government contracts and milking taxpayers more than their technical ability. They would never survive in the private sector. This is the first time an administration has paid such huge political cost for mismanaging technology. Prior to this, Presidents understood they were responsible for the economy, jobs, wars, terrorism, crime, responding to natural disasters, etc. They never realized there was political risk with technology. President Reagan wasn’t blamed for the Space Shuttle exploding, but this administration has become responsible for this web site disaster. Frankly, I don’t think the politicians have any better handle for designing rockets or web sites. They relied on contractors and these contractors misled them. The policy makers don’t realize the goals and values of the contractors differ from theirs. Watching our leaders say the self-serving things their contractors tell them is even more embarrassing. Those contractors are not your friends! Some government officials are swayed by promises of post-retirement jobs at the contractors they supervise. Look at all the former program managers, contracting officers, Congressmen, admirals and generals at these government contractors and their lobbyists to understand how business is done. Contractors get on contracting vehicles like the IDIQ for Healthcare.gov (termed “Licenses to Hunt”), then send in their well connected people to get contracts directly or wire contracts by “helping” draft requests for proposals (RFPs) favoring their organization. Perfectly legal. Not taxpayer friendly. This is a bipartisan issue because unless IT government contracting is reformed, this is going to bite future politicians/policymakers of both parties. They do not have the training or experience to manage these technology projects. Especially when the contractors are run by used car salesmen who say, “You should get the undercoating” and the government people are technically unqualified to say “No”. We need the creation of a Technology Accountability Office (TAO), similar to the GAO to help agencies properly manage and buy these solutions, or an agency that manages large IT projects so the Best Practices are dispersed across the agencies. Right now, politicians have no clue whether a project should cost $1 million or $100 million, and whether it can be done in 3 months or 3 years. It’s total chaos and taxpayers are paying the tab. Here are a few opportunities where I’ve spoken about these issues. Will HealthCare.gov be in good health by Nov. 30? Greta van Susteren is on vacation, so I chatted with Kimberly who was in New York City while I was on Greta’s studio in Washington, DC. I had the opportunity to discuss the problems with government IT contractors in my prepared testimony and questions from Chairman McCaul. As a result, I’ve received considerable national media attention in newspapers, television, and radio. I even Testified before the House Homeland Security Committee on November 13th. More recently, suggestions for Designing a Data Entry System Properly; Overhauling the Healthcare.gov Web Site. Here are some of the media spots in chronological order as the controversy evolved. Chung supports the new health care law but said it was not the demand that is crashing the site. He thinks the entire website needs a complete overhaul. “It’s not even close. It’s not even ready for beta testing for my book. I would be ashamed and embarrassed if my organization delivered something like that,” he said. I was featured in an article on CNN entitled Obamacare glitches known ahead of time? Brian Todd came by the office to learn more about the challenges I encountered and the web site actually crashed while I was showing it. ObamaCare website neither fast or easy? Peter stepped through the site and struggled to even get a user name. Then I made a few comments around 1:11. Database expert Luke Chung has suddenly become an expert on the failings of the Obamacare computer system, all because it kept crashing as he tried to get a quote. Dave Ross and Luke go in depth on what Luke found after he dug into it (stunning ineptitude) and how he could fix it easily for a fraction of the cost. Whether you’re a geek or not, you’ll enjoy this fascinating conversation. The company that built the botched website where people are supposed to sign up for the Obama’s health care exchanges has spent millions of dollars developing Healthcare.gov, but people are still having trouble signing up. NBC’s Tom Costello reports. I’m on at 1:12 discussing the unnecessary complexity of the system and ways to improve it. A nice conversation with Sean Hannity helping him understand the technical problems with the Healthcare.gov web site. About 15 minutes. Sean liked the conversation so much, he invited me to appear on his TV Show next week. Interviewed by Joie Chen on Al Jazeera America shot at their studio located in the Newseum. This was my first live broadcast. I don’t think anyone saw it, so it was good practice. Interviewed by Steve Malzberg on his radio show. Interviewed by Geraldo Rivera on his morning radio show. A very engaging four minute one-on-one conversation with Sean Hannity. White House economic advisor Jeff Zeints has said that by the end of November — just five weeks away — the federal healthcare website will be working smoothly for the vast majority of users. NBC’s Tom Costello reports. Tom Costello concluded from my comments that I didn’t believe the new team would be able to fix the site by the end of November. While I believe that will be a challenging deadline, my contention all along is that this website is not that difficult to implement. With the proper design and development team, they could create a functional version of Healthcare.gov in five weeks. Their families, however, shouldn’t expect to see them much over Thanksgiving weekend. Unfortunately, I haven’t received a clip of the episode. Will post it if/when we receive it. “It’s like polishing a turd. Either way, you still have a turd,” Chung said bluntly. He criticized the design of the site, and said it didn’t need to be so complex.He said a much simpler site would serve its purpose better, make it easier for the public to use and would likely only take a month to build. Appeared with Greta to discuss what went wrong. Chung, who is testifying in front of the House Oversight committee today, said these technical issues are the most frustrating. I was invited to testify before the House Homeland Security Committee. I provided a written testimony and gave a five minute opening statement before answering questions from Chairman McCaul. Quoted in this article based on my testimony yesterday before the House Homeland Security Committee. Was interviewed by the article’s authors on November 18th for additional research into how the contractors took advantage of taxpayers. My third appearance on Sean Hannity’s radio show. I’ve become his “technical expert” and we discussed how the Healthcare.gov government contractors abused taxpayers in addition to being inept. Also discussed how the website could be designed properly and how we created the Logistics Support System for the United Nations, deployed in 80 countries, for under $500K. And that platform can be localized in any language while Healthcare.gov was supposed to also be in Spanish and they don’t even have that. In the month and a half since Healthcare.gov debuted, I think everyone has finally accepted how technically awful the website is. Maybe this will be the end of my media attention. Where’s the anonymous shopping perk? I’ve been a technical resource for Robert Pear of the New York Times since he quoted me in an article that kicked off all this media attention on October 8th. Luke Chung, the president of FMS, a database company in Virginia, said building the website to handle 50,000 simultaneous users was “not unreasonable.” But he said the government must be prepared to handle much larger numbers at peak times like Dec. 23, just as the Internal Revenue Services does at the tax filing deadline in April. Luke Chung, president and founder of Virginia-based software development company FMS Inc., said success for the website would be determined by both the number of users as well as how long they are in the system. He compared it to a highway, noting that 50,000 people traveling 60 miles per hour is smooth traffic while the same number going 10 miles per hour is a jam…Chung cited December 23 as the most significant deadline, noting that demand would be “huge” because people by nature wait until the last minute to act. The Obama administration has just one day to get its Healthcare.gov website running more efficiently, but officials are already trying to limit expectations once again. Featuring Sarasota Bay behind me. I appeared on a panel with three others for a live interview discussing the relaunched Healthcare.gov web site. Tried to explain how software works to better understand the expected 1% error rate since software either works or doesn’t. Do they expect 1% of the people to crash for unknown reasons or do they know certain situations will always crash and only expect 1% of the people to do that. Frankly, I don’t understand how anyone develops software with expected failure rates like this. Here’s a new blog post with my more detailed technical assessment of the new web site: Who Thinks the Relaunched Healthcare.gov Performance Metrics are Acceptable? Appearing with David Kennedy, I discuss how the Healthcare.gov web site should have cost less and been designed with security up front. The contract for the Healthcare.gov site has moved from CGI Federal to Accenture, but Accenture doesn’t really have a better team to put in place. In the typical large government contractor world, the winner of a contract simply hires the existing team and moves them to their payroll. The people who do the work remain and change their business cards. Do we really expect significant improvements from a team that created the original site and thought it was ready for the public? Due to the media attention I’ve attracted on Healthcare.gov, I’ve been invited by the US House of Representatives Committee on Homeland Security to testify about the website. This committee is responsible for all security issues on .GOV web sites. The hearing is entitled: Cyber Side-Effects: How Secure is the Personal Information Entered into the Flawed Healthcare.gov? and will be streamed live from their web site. A recording should be available later. The hearing is at the Cannon House Office Building and starts at 10 AM on November 13, 2013. This is a formal testimony that I provide under oath. I will be on the second panel with one other person: Waylon Krush, CEO of Lunarline, Inc. We will each have an opportunity to provide a five minute statement, followed by questions from the Congressmen that will switch between Republicans and Democrats. The event is open to the public with limited seating on a first-come, first-serve basis. The testimony took place in the committee chambers. The first panel took over two and a half hours. By the time my panel was called, all the Congressmen had left with the exception of Chairman McCaul. Here’s a clip of Chairman McCaul’s introduction of me. The testimony continues in Video 2 with some questions from Chairman McCaul and I describe how government contractors take advantage of taxpayers. My blog post on October 1st, Healthcare.gov is a Technological Disaster, described my experience using the Affordable Care Act’s Healthcare.gov website on its first day. Based on my experience, I could tell the Obamacare site was a technical mess independent of the number of users on the system. However, “Too many users” was a convenient and politically positive excuse the contractors and administration attributed to the failure of the website. It took about a week before the press began to understand that wasn’t the case. Because of my blog post, I ended up in a New York Times article, the national broadcasts of CBS, CNN and Fox News, and a few radio shows (links are in my prior blog post). I was also invited by the House Energy and Commerce Committee staffers on Capitol Hill to meet them to help them better understand what was and wasn’t working and why. I dislike complainers who don’t offer solutions, so I feel obligated to offer some constructive ideas for creating a functional Healthcare.gov website. I’m not being paid to work on the Healthcare.gov web site and don’t have the actual specifications of what needs to be created, but based on my experience building database solutions and understanding load balancing, I offer the following ideas to consider. It’s important to understand what the web site should do. The primary mistake the designers of the system made was assuming that people would visit the web site, step through the process, see their subsidy, review the options, and select “buy” a policy. That is NOT how the buying process works. It’s not the way people use Amazon.com, a bank mortgage site, or other insurance pricing sites for life, auto or homeowner policies. People want to know their options and prices before making a purchase decision, often want to discuss it with others, and take days to be comfortable making a decision. Especially when the deadline is months away. What’s the rush? The existing process acts as if a retail website asked for your credit card number before showing what you could buy and their prices. Almost all sites let you browse without creating a user name. Retailers want you to see what’s available as quickly and easily as possible. People often visit multiple times before buying. Only after making a purchase decision should personal information be collected to complete the transaction. The web site needs to reflect this and support a more common buying process. Here’s an overview showing three distinct processes that flow into each other (or people buy a policy at their step and leave the system). A critical part is offering a comparison matrix at each level so consumers can quickly see the differences between the insurance policies. The first one gives policy options and non-subsidized quotes. People can click to purchase the policy from the insurance company. If so, they leave Healthcare.gov and the government is no longer involved. The second provides a subsidy estimate and uses the same display as the first but with and without subsidized prices. People can also click to buy the policy without a subsidy and leave the system, or they can officially apply for a subsidy. The third is the actual application for the subsidy and the only path which collects Personally Identifiable Information (PII). Higher security is necessary for this. The first two do not require PII and would not require high security. That means a commercial cloud service such as Microsoft Azure could be used to host the site and adjust to high traffic loads. It would support people shopping and browsing multiple times before buying without the need to invest in hardware or bandwidth. With this improved design, only a small portion of the site’s traffic would be in the final subsidy application portion. That can be isolated with high security and for much lower volumes of users since people would only apply once. Hassling people at this stage with lots of personal questions is acceptable since people are serious about purchasing. Once policy options are offered, allow users to create a login to save their inputs, and get back into the system to recover their work-in-progress. This would be required with the formal subsidy application but not necessary for the other options. Performance: The system should move people through the process as quickly as possible. Collecting Information: It should not ask for any information that’s not required for generating the policy options and prices. Fewer Screens: Rather than having one screen per question, multiple questions should be asked in as few screens as possible. People know how to scroll. Extra screens should only be added if they depend on answers from previous screens. Data Security: The first part of data security is to NOT collect sensitive information. Sensitive information should only be collected from people actually applying for the subsidy. Data Integrity: All database changes need to be in transactions with commitments and rollback on failure. Situations where accounts are partially created with a valid user name and no account details should never occur. No Other Connections During Data Entry: The system should not be connecting to other data sources while the user is entering data. Just collect the data. Offline Processing: Once the user enters all their data for a subsidy quote, a separate system processes the applications and interfaces with the other systems to validate the data and calculate the subsidy. By separating this process from the user’s online experience, problems with connections to other systems do not impact the user. Notification to Insurers: Web pages and web services to allow real-time views of the status of applications selecting the insurer’s policies. Commercial Cloud Hosting: Using a commercial cloud platform would provide automatic scalability to meet fluctuating levels of users without having to make hardware purchases. By eliminating the need to collect and store sensitive user data for most of the website, commercial cloud hosting and its benefits are available without security concerns. Real-time Displays: Monitor user progress with summary tables and graphs showing the status of people moving through different stages of the system. Basic Business Intelligence: Summary and drill-down details by state, date, hour, etc. System Transparency: Provide a public view of some data in a cached mode (updated daily or hourly, but not real-time). Display the available plans with options to compare and filter them easily based on plan level (gold, silver, bronze, etc. ), provider, price, etc. Should be similar to retail web sites like Best Buy or Staples showing different products and their features in a matrix comparison, with buttons to get more details and a button to select one to buy. One would expect users to come to this site multiple times over multiple days to learn about their options before making a purchase. An option to save the inputs. This would be the first time to create a simple account to collect user information (which does not include things like social security numbers, birthdates, or names). A simple user name (email address) and password, with a standard email confirmation that doesn’t have a time limit. This would allow users to get back to the previous screen without re-entering their data. An option to get a subsidized price estimate. If the person chooses this option, they create a simple account because highly sensitive information will not be collected. The account is simply to retrieve the user’s entries. The user provides the information necessary to calculate the prices without having to lookup data from government sources. The user can enter their values for income and whatever other factors impact generating a subsidy estimate. Just like bank web sites let you enter basic information to get a mortgage or car loan rate before you apply, Healthcare.gov should do the same. This would allow the site to create quotes quickly without having to bog down or wait for the other sites such as the IRS, Experian, etc. This minimizes the impact of too many users. 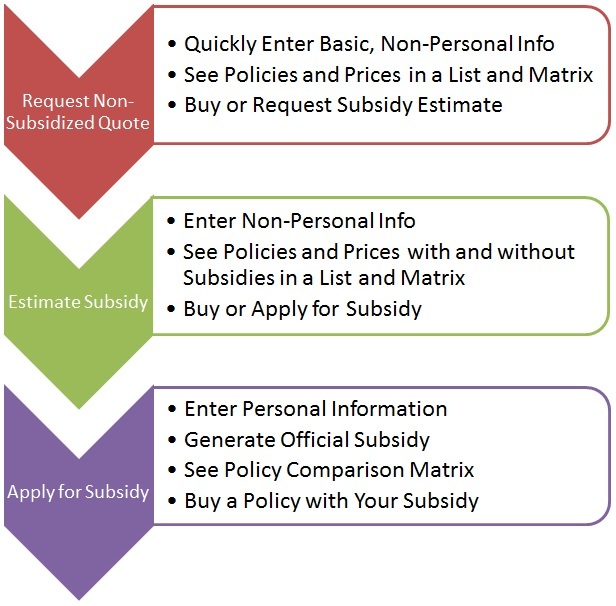 Once the estimated subsidies are calculated, a display similar to #3 above would show the options. Finally, applying for the subsidy. Once someone decides they want a particular policy, they can officially apply for a subsidy. This is the first time personal data needs to be entered. The system should collect the data as quickly as possible without having to validate the information while the user is entering it. Once all the data is collected, the user is informed via email when the subsidy calculation is ready. A separate background process calculates the subsidy requests and looks up the necessary data from the different sources. If any of those linked systems is unavailable, it’s no big deal since it doesn’t impact the user on the web site. The user is already gone and waiting for an email. Once the calculation is generated (or if it couldn’t be generated), the user is notified via email and they can view the results by logging back into their account. For management, there should be dashboards with tables and graphs showing what’s happening. No more excuses of not knowing how many people are in each phase of the process, how many have received quotes or enrolled, etc. For transparency, some of this information should be publicly available updated at least daily. I’m not sure whether the people designing and developing the site will find these suggestions helpful. There’s obviously lots of details not included in my proposal, but I’m confident my basic design is a significant improvement over the original site. It would provide a better user experience, be much easier and faster to develop, easier to test, and more scalable and secure. Was it that tough to envision earlier? Let’s remember, this website remains the automation of a paper form. It’s not as hard as providing healthcare.